The American Flag means many things to many people. It’s one of the most recognized symbols around the world. I’ve shared here a couple of pictures that I took last weekend in Grand Junction and at Mesa Verde, in southern Colorado. Also below are interesting facts about the U.S. Flag. Enjoy, and Happy Independence Day! By 1777, the U.S. was still waffling on the exact look of its flag. This was a cause for concern for Thomas Green, an American Indian who wanted the protection of an official flag while traveling through treacherous territory to Philadelphia. Thomas asked for help from Congress, throwing in the aforementioned payment to sweeten the deal. Within 10 days, a resolution was passed, finalizing the flag as a creation with 13 stars and 13 stripes. The date: June 14th, 1777. Wampum: A quantity of small cylindrical beads made by North American Indians from quahog shells, strung together and worn as a decorative belt or other decoration or used as money. She may have sewn quite a few in her day, but there is no actual evidence that Betsy Ross was the person responsible for the design of the US Flag. In fact, Betsy’s name didn’t even come up in conjunction with the deed until 1876, forty years after her death. The first person to have made that claim publicly was New Jersey Congressman Francis Hopkinson in 1780, who had hoped (in vain) to earn a “quarter cask of the public wine” for his efforts. Apparently, he didn’t take wampum. An aside: there also seems to be dispute as to whether Betsy Ross even lived in Philadelphia’s popular Betsy Ross House. The flag has 13 stripes…except when it didn’t. Upon welcoming Vermont and Kentucky—states 14 and 15—into the union, a new version of the flag was created that had 15 stars and 15 stripes. As the U.S. continued to add new states, there was concern about having to continually add additional stripes. The solution: revert to 13 to represent the original 13 colonies, and let the stars do the heavy lifting. Some of the star fields have been pretty strange looking. The 50-star pattern was created by a high school student. When Alaska and Hawaii became states 49 and 50, President Eisenhower received thousands of ideas for an updated flag. Almost all of them were of a 50-star flag, including one from Robert G. Heft, a 17-year-old student at Lancaster (Ohio) High, who created the design for a class project. He was one of three to submit the version that was accepted and remains in use today. Robert got a B- on his project. The 50-star flag is the first one to have lasted more than 50 years. In contrast, over a 50-year period in the early 1800s, the flag went through 17 different versions. 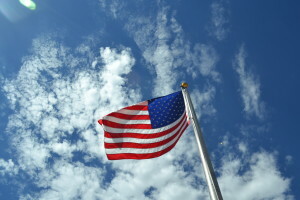 The actual flag that inspired “The Star Spangled Banner” still exists. The flag that flew at Ft. McHenry during the War of 1812, immortalized in Francis Scott Key’s tune, is one of the few remaining specimens of a 15-star, 15-bar flag. What’s left of it is on permanent display at the Smithsonian’s National Museum of American History. 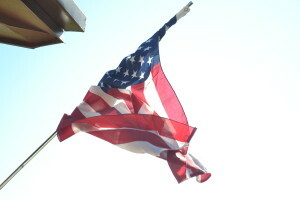 A snippet of that flag sold at an auction in 2011 for $38,000. The flag in question was a victim of “souveniring,” a once-common practice where sections from flags were snipped off and sold as mementoes. The 2” x 5” swatch in question was taken from the flag in the 1800s. The Flag Desecration Amendment failed in 2006. The proposed constitutional amendment would have prohibited not only burning the flag (for political reasons) but printing it on disposable items such as t-shirts or napkins. The amendment fell one vote short in the Senate. Of the six flags planted on the Moon, five of them are still standing. The one that’s not: the first one, planted by Neil Armstrong during the Apollo 11 mission.